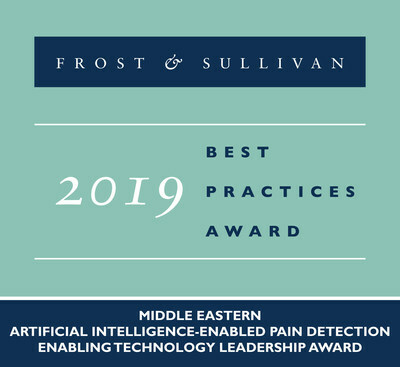 LONDON, April 8, 2019 /PRNewswire/ — Based on its recent analysis of the Middle Eastern market for artificial intelligence (AI)-enabled pain detection solutions, Frost & Sullivan recognises Dubai-based AIDirections with the 2019 Middle East Enabling Technology Leadership Award. The company’s one-of-a-kind AI-powered pain detection solution is revolutionising the market by using facial recognition technology, which is invaluable to impaired patients and people with minimal cognitive functions. The solution has a wide scope of application among highly vulnerable patient populations, such as infants, children with developmental issues, people suffering from a stroke, and people who are unconscious and unable to express their pain. While several existing technological tools, such as mHealth, clinical wearables, and telemedicine, ensure optimal pain management in a home-based setting, patients still need to visit care facilities frequently to have their pain levels assessed. AIDirections’ tool emerges as an ideal solution in this environment because it integrates with the healthcare system’s existing telemedicine to create a better care experience for the patient. AIDirections is working with several telemedicine companies to launch its offering officially as a holistic home-based solution in the growing Middle Eastern market and other developing regions. The company presents both server and cloud-based solutions that easily integrate with a hospital’s enterprise resource planning or customer relationship management software for easy deployment. The hospital pays a minimal onboarding fee, which includes installation and software setup. By reducing upfront costs, AIDirections helps clients achieve a faster return on investment. Each year, Frost & Sullivan presents this award to a company that develops a pioneering technology that enhances current products and enables the development of new products and applications. The award recognises the high market acceptance potential of the recipient’s technology. AIDirections is a Dubai based company, which was established in response to the exciting developments in Artificial Intelligence (AI). The target market for AIDirections is the GCC, concentrating on UAE and Saudi Arabia. AIDirections’ value proposition is based on the development of use cases across a number of industries, particularly healthcare. We are providing consultancy for the best use of AI, and we are also developing a set of products through the use of computer vision. The core staff of AIDirections brings together significant experience in research and development, technical standardization, management of research and development, development and implementation of national level strategies, futures study and work, international collaboration and consultancy. Provision of IoT solutions, e.g. for oil and gas or smart cities. Frost & Sullivan, the Growth Partnership Company, collaborates with clients to leverage visionary innovation that addresses the global challenges and related growth opportunities that will make or break today’s market participants. For more than 50 years, Frost & Sullivan has been developing growth strategies for the global 1000, emerging businesses, the public sector, and the investment community. Contact us: Start the discussion.